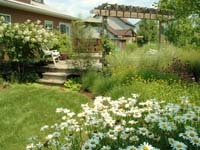 Biafore Landscape Development personnel have extensive backgrounds in horticulture and plant culture. Our broad plant palette enables us to cater to all needs and tastes in planting design and selection. We are able to design plantings for new and existing homes as well as design period specific and historical landscape plantings. "Biafore Landscape helped finalize the intricate soil type, appropriate plantings for this area and all within our budget. Biafore knew of our tight schedule for the Plaza landscaping and our strict safety requirements and Biafore did not falter on either aspect."